Samarium is a naturally-occurring chemical element with atomic number 62 which means there are 62 protons and 62 electrons in the atomic structure. The chemical symbol for samarium is Sm. Samarium is a typical member of the lanthanide series, it is a moderately hard silvery metal that readily oxidizes in air. Samarium was first discovered in 1879 by the French chemist Paul Émile Lecoq de Boisbaudran. The name samarium is after the mineral samarskite from which it was isolated. Although classified as a rare earth element, samarium is the 40th most abundant element in the Earth’s crust and is more common than such metals as tin. Naturally occurring samarium consists of five stable isotopes, 144Sm (3.08%), 149Sm (13.82%), 150Sm (7.37%), 152Sm (26.74), 154Sm 22.74%), and two isotopes with very long half-life 147Sm (15.00%), 148Sm (11.25%). Therefore naturally-occurring samarium is slightly radioactive – about 128 Bq/g. In nuclear industry, especially natural and artificial samarium 149 has an important impact on the operation of a nuclear reactor. Samarium 149 has a very large neutron capture cross-section (about 42,000 barns). Since natural samarium contains about 14% of 149Sm, it can be used as an absorbing material in control rods. Samarium 149 is also an indirect product of U-235 fission. For physicists and for reactor operators, it is important to understand the mechanisms that produce and remove samarium from the reactor to predict how the reactor will respond following changes in power level. Samarium – 149. Neutron capture and total cross-sections. Neither the cross-section nor the yield is as big for this nuclide as for xenon 135, so the samarium reactivity effects are much smaller. 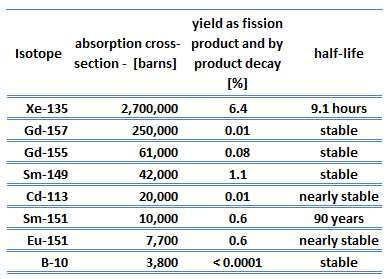 Table of total yields for various nuclei – thermal fission. To understand these issues, we have to perfectly understand the production and removal of samarium 149. 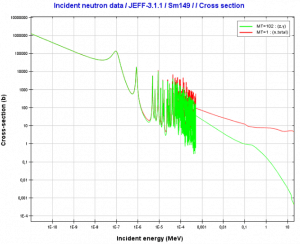 Fission does not produce Sm 149 directly. The fission yield of samarium 149 is nearly zero. Sm-149 is in the decay chain of the the fission product neodymium 149, which decays to promethium 149. 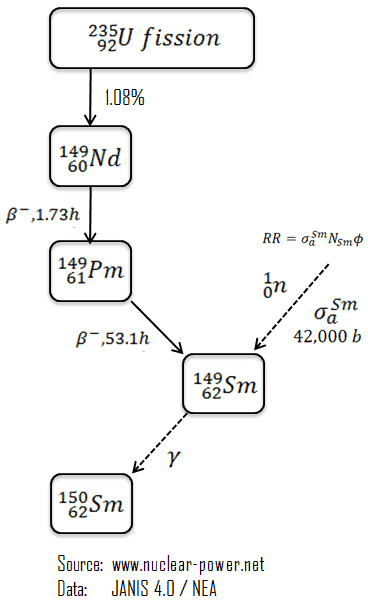 Because of the short half-life of Nd-149 (compared to the half-life of Pm-149), promethium may be considered as if it were formed directly from fission. The decay sequence is depicted on the figure. An important difference between Xe-135 and Sm-149 is that samarium 149 is a stable isotope, and therefore remains in the core after shutdown. There are only two ways of samarium removal. One of these processes is the samarium burnup, when the reactor is at power operation. The rate of samarium burnup is dependent upon the neutron flux and the samarium 149 concentration (i.e. the reaction rate). The second process is associated with refueling. During refueling usually one third or one quarter of the core is removed to spent fuel pool and replaced by fresh fuel assemblies, while the remainder is rearranged to a location in the core better suited to its remaining level of enrichment. Therefore refueling naturally leads to a decrease in the overall samarium content in the core. Assuming that fission does not produce Sm 149 directly, and neglecting the small amount of promethium burnup, allows the situation to be described as follows. The production and removal of samarium can be characterized by the following differential equations. When the rate of production of promethium equals the rate of removal of promethium equilibrium exists. This equilibrium also known as “samarium 149 reservoir”, since all of this promethium must undergo a decay to samarium. In equilibrium, the promethium concentration remains constant and is designated NPm(eq). The following equation for the promethium equilibrium concentration can be determined from the preceding equation by setting the dNPm/dt =0. Since the equilibrium promethium concentration is proportional to the fission reaction rate, it is also proportional to reactor power level. This expression for equilibrium samarium 149 concentration during reactor operation illustrates that equilibrium samarium 149 concentration is independent of neutron flux and power level. It follows the time of saturation is dependent upon the neutron flux level. The equilibrium concentration usually produces negative reactivity (samarium worth) of about -600 pcm. After reactor shutdown, the neutron flux drops to zero and there remains no channel of removal of samarium. On the other hand, there is significant amount of accumulated promethium that decays to samarium, therefore the concentration of samarium increases to a new level. This buildup is dependent upon the neutron flux level before the shutdown(i.e. upon the promethium equilibrium). The new equilibrium is reached in approximately 20 days, and since samarium 149 is stable, the concentration remains essentially constant during reactor outage. Samarium 149 does not peak as xenon-135 does, but increases slowly to a maximum value as shown in figure. As was written samarium can be removed from the core by refueling. During refueling usually one third or one quarter of the core is removed to spent fuel pool and replaced by fresh fuel assemblies (without samarium), while the remainder is rearranged to a location in the core better suited to its remaining level of enrichment. Therefore refueling naturally leads to a decrease in the overall samarium content in the core. After reactor startup samarium concentration usually decreases as a result of samarium burnup and very slow decay of promethium. Similarly, transient changes in samarium on power level changes are very small compared to xenon, and change very slowly over a week or so. In each case, the samarium level returns to the same equilibrium value. 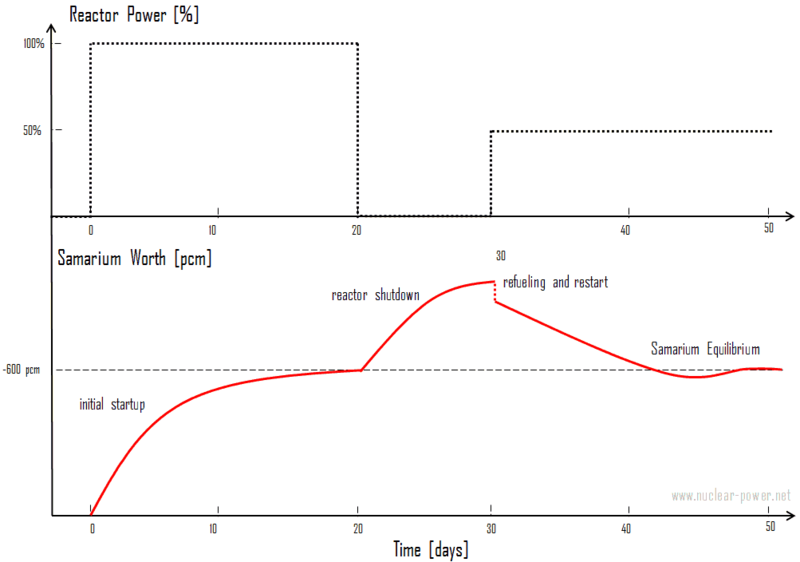 Although samarium-149 has a constant poisoning effect during long-term sustained operation, its behavior during initial startup and during post-shutdown and restart periods requires special considerations in reactor design. It was written, the samarium equilibrium is independent of the neutron flux level, therefore stationary samarium worth is independent as well. Note that, the promethium equilibrium, which determines especially the samarium peak concentration after shutdown, is flux dependent! The way of reactor shutdown must be taken into account in estimated critical conditions calculations and it can influence MTC at the beginning of the next cycle. Moreover, especially high flux research reactors, must not be shut down suddenly. Sudden shutdown of a reactor with thermal flux of about 1019 neutrons/cm-2.s-1 can cause more than thirty times higher samarium poisoning as in PWRs. This can cause permanent poisoning and preclude any reactor startup. These reactors must lower the reactor power gradually in order to burn off as much samarium 149 as possible before shutdown. Special reference: Paul Reuss, Neutron Physics. EDP Sciences, 2008. ISBN: 978-2759800414.